Prior to 2009, fathers of newborns or adopted children in the military could not take time off unless leave was charged from what they earned each year. Each military member earns 30 days a year. However, there is now paternity, or parental, leave in the military that is non-chargeable. Ten days of non-chargeable leave is the same as getting four months of accrued leave for free at the normal rate of 2.5 days per month. 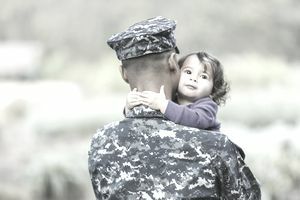 The FY 2009 Defense Authorization Act established the paternity program which allows up to ten days of non-chargeable leave for new fathers in the military. The Act left it up to the individual services to develop plans to implement the new benefit. Each branch differs by days allowed to take non-chargeable leave periods as well as the time before and after the birth is limited. If deployed during birth, however, you are still allowed to take additional paternity leave upon return. This additional free leave period can also be taken in conjunction with regular leave earned through time in service. The FY 2017 Defense Authorization Act made a few changes to the policy and actually increased the amount of time the different service branches members can take non-chargeable leave time before or after the birth of a baby in the family. This change was designed to meet or come close to the levels of time available for civilian counterparts in the corporate business sector. Typical civilian workforce maternity leave is 12–18 weeks and paternity leave in the corporate world ranges from 7–10 days to as much as 10 weeks of paid leave. Both maternity leave and paternity leave have been given a boost with the new FY 2017 bill. Existing Department of Defense (DOD) policy from FY 2009 defined maternity leave as, "a convalescent period up to 6 weeks following pregnancy and childbirth." The new policy extended the period of maternity leave for up to 12 weeks. DOD also sought legislative action to extend parental leave up to 14 days. Parental leave for a service member whose spouse gives birth was first authorized in the National Defense Authorization Act for Fiscal Year 2009 for a maximum of 10 days. The Navy was the first service to implement the new program. Initially announced in Navy Administration (NAVADMIN) message 341/08, the Navy's paternity leave policy is that commanding officers will—dependent upon the unit's mission, specific operational circumstances, and service member's billet or job—grant ten days of non-chargeable leave to a married member of the Navy on active duty whose wife gives birth. Paternity leave can be used in conjunction with ordinary chargeable leave. Paternity leave is not required to be used immediately but must be taken the first year (365 days) of the birth of the child, though it is possible to have the 12-year limit waived if warranted by exceptional circumstances that prevented the use of paternity leave within the limit. The member is not required to use the leave in a single block of 10 - however, it may not be used consecutively in conjunction with liberty (normal time off, such as weekends and holidays), or special liberty (such as a 3-day pass). The entitlement is limited to 10 days, regardless if it is a multiple birth (twin, triplets, etc.). In 2015, Secretary of the Navy Mabus tripled the 2009 requirement to 18 weeks of paid maternity leave for the mother for members in the Navy and Marine Corps. The FY 2017 Department of Defense-wide policy overrides a policy change made by the Navy Secretary. The current policy is 12 weeks of maternity leave and 10 days of paternity for spouses of the mother. The Department of Defense is seeking legislative change that would allow a second parent, in the case of dual service military couples, to request two weeks of parental leave. Married couples in the military (both spouses are active duty) make up over 80,000 couples. Currently, the amount of time in the Navy is 10 days for all parents who are not the primary care provider. For complete details, refer to MILPERSMAN 1050-430 - Paternity Leave.